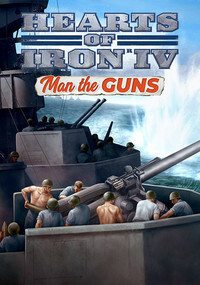 Hearts of Iron IV: Man the Guns is an expansion to a strategy game developed by Paradox. This is not a standalone DLC, as it requires the base game to work and it expands the naval aspects of the game by implementing new options for designing and upgrading ships. This is Hearts of Iron IV expansion pack. Hearts of Iron IV: Man the Guns for PC Windows is an expansion to the 2016’s strategy game called Hearts of Iron IV. This is not a standalone expansion, as it requires the base game in order to work. Both titles were developed by Paradox Development, also known for creating such games as Crusader Kings II, Stellaris and Europa Universalis IV. As befits a typical DLC, Man the Guns does not offer any radical changes to Hearts of Iron IV. Players still get a large scale strategy game, in which they control a country before and during World War II. Instead of implementing revolutionary changes, the developers decided to introduce new content and develop some of the base game’s elements. When working on Hearts of Iron IV: Man the Guns, they focused on the naval aspect of the game. Players have now more options to design their own ships – they can decide on the armor and the type of weaponry. They also can upgrade older vessels to align them with the rest of the fleet. This expansion introduces several new options for the democratic countries, such as new sea routes for i.a. the USA. The PC Windows release of Hearts of Iron IV: Man the Guns does not offer any large technical enhancements and presents the same quality as the 2016’s base game. What is worth mentioning, similarly to other expansions, the premiere of Man the Guns was accompanied by a free patch that added some additional options to the base game. Game score 9.1 / 10 calculated out of 43 players' votes. Expectations before the premiere: 8.4 / 10 calculated out of 30 players' votes.